Discovering Eastern will take you through very important cities in the history of Cuba. Santiago de Cuba, keeps great events and places of revolutionary struggle. You will know the oldest city in Cuba: Baracoa, with more than half a millennium of history and places of natural reserve. The famous and very visited beach Guardalavaca, the city of Holguín and Bayamo will complete your trip of surprises and joys. 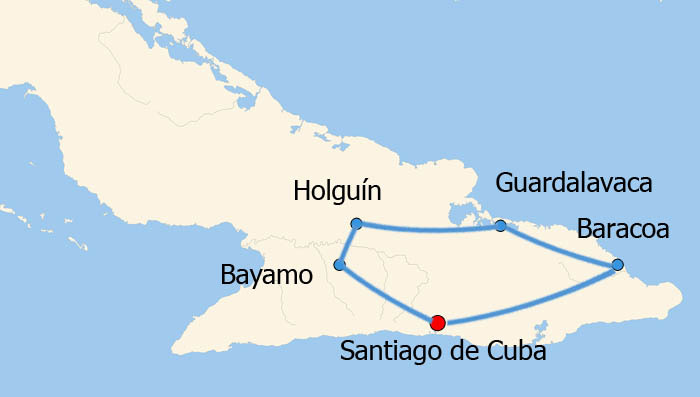 Three nights in Santiago de Cuba, one night in Baracoa and two nights in Holguin. 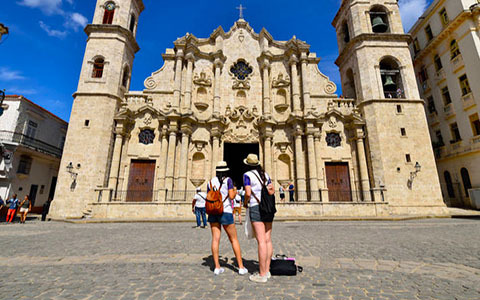 Santiago de Cuba City Tour, Excursion to Guardalavaca, Holguin-Bayamo City Tour. 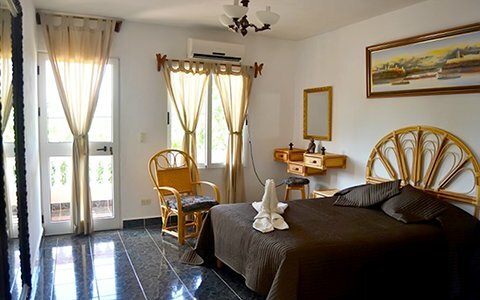 Accommodation in Santiago de Cuba. Duration: 4 HRS Departure time: 09:00 HRS Notes: Lunch and 1 drink included. Known as the ‘Heroic City’ for the contribution of its people during the Cuban revolution and independence wars, Santiago de Cuba is a unique city with multiple layers, where visitors can get in touch with the idiosyncrasies of its people, culture and history. The traditions here have earned Santiago de Cuba the label as Cuba’s most Caribbean destination. Santiago de Cuba’s geography is hot and hilly; its tenor exotic and carnivalesque. With an expert local guide, you’ll discover what makes this city tick. An introductory city tour is good value – both to see the in-town sights and the historic landmarks in the immediate vicinity. This tour takes you to the Loma de San Juan (San Juan Hill; famous site of Teddy Roosevelt and the Rough Riders’ charge); Moncada Barracks; and Revolution Square. Our guide brings Santiago’s history to life by providing context and sharing stories from the city’s colorful past. This tour also includes panoramic visits to the sprawling and serene Cemetery Santa Ifigenia (see also under Remarks), Castillo El Moro (a UNESCO World Heritage Site) and the Bar Ron Caney (rum). Free time is scheduled to stroll through Park Céspedes – a gathering spot for Santiagueros young and old to play chess, make music or sit on a bench to gossip and people watch. Baracoa is the oldest city in the Greater Antilles. The “Primada” of Cuba has, as a witness of its longevity, the Cruz de Parra left behind by Christopher Columbus, the conqueror of America. The city, presided over by the church, has been rebuilt several times, but Baracoa hasn’t lost its signature: old, calm, unique. Locals continue to hand make the same flavorful dishes that were created generations ago. Here you can find combinations almost impossible to find in other regions: beans with coconut milk, bacán (a type of tamale), tetí (small fish). According to popular belief, those who bathe in the Miel River (one of the many that converge in the area) will always return to Baracoa. Here you will be able to appreciate the biggest waterfalls of the island and the most virgin and beautiful forests of Cuba. In the territory of Baracoa is located Alejandro de Humbolt Park, paradise of the Cuban high east considered the most extensive of the National System of Protected Areas, constitutes the core of the Biosphere Reserve Cuchillas del Toa, is one of the most diverse and endemism not only in Cuba, but throughout the Caribbean and perhaps in the world. Both on the way out and the return, you will enjoy one of the 7 wonders of civil engineering in Cuba: "La loma de la Farola". Holguin, one of the most beautiful cities in Cuba, is famous for its beaches, but also for its people and history. It is also known as the city of parks. Here you will enjoy a full day excursion to the famous beach: "Guardalavaca", one of the most visited tourist poles of Cuba. The first stop will be at the famous landmark Loma de la Cruz. Loma de la Cruz (hill of the cross) although small it holds great history and folklore. It takes its name out of a wooden cross that exists in its summit, a protective symbol for many people. You can either climb the steps all the way to the top or just take a short ride in car. After enjoying the magnificent views of the city, descend all the way to the city center and walk around with your local guide. Stop at Parque Calixto Garcia to visit the Provincial Museum, Parque Las Flores and Plaza de la Marqueta. The monumental neoclassical building, known as La Periquera, is one of the most famous in the city. Its long history is part of the charm of the beautiful Provincial Museum. We will also visit the local publishing house “Cuadernos Papiros”. After lunch in Bayamo: horse-drawn carriage ride and walking tour along the Bayamés Promenade. In addition, visits to: Wax Museum, Plaza de la Revolución and its surroundings, Casa de Carlos Manuel de Cespedes Museum, Anthem Plaza, San Salvador Cathedral of Bayamo and the Altarpiece of the Heroes. In the afternoon we will continue to the city of Santiago where you will spend the night.